However you spend your time in France, CA Britline can provide insurance to cover both your everyday and leisure time activities. We invite you to discover the advantages of a variety of cover and additional options which we are sure will convince you to request a quote. Premium assistance services: including breakdown at your own home (2) and a replacement vehicule (2) for example. Our car insurance contract comes with 2 levels of cover- 3rd Party and Fully Comprehensive. Both levels of cover adapt to your driving needs thanks to their guarantees and the impressive options that satisfy all eventualities. Whichever formula you choose, driver protection is included because you are at the heart of our concerns. If you have not made a claim in the last 3 years, you will benefit from a reduction of up to 15% off your annual premium from the moment you subscribe thanks to our ABC Scheme (Avantage Bon Conducteur). Every year thereafter, if you do not make a claim you will accumulate an extra 2% reduction on your annual premium, up to a maximum of 20%. This is on top of your no claims bonus! You benefit from a reduced tariff adapted to the use of your vehicle. If your vehicle is destroyed or stolen during the period of your loan, having been in circulation for at least 12 months, you will receive a higher reimbursement for your loss. You benefit from the cover you really need: accidental damage, public liability, broken glass, theft and vandalism, fire. If you have already chosen to insure your French property through CA Britline and Pacifica Insurances we would like to thank you for your confidence. In order to take things one step further we are offering you an exceptional deal on car insurance which enables you to benefit from 5% off your policy for life*. For more information on all our insurance services, please do not hesitate to contact us. *Offer available to existing holders of French home and contents insurance only. Applies to cars which are habitually kept at a French address. 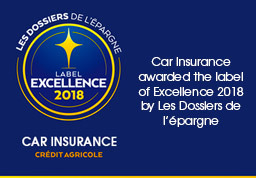 The car and boat insurance contract and its options are provided by PACIFICA, the insurance company, subsidiary of Crédit Agricole SA. PACIFICA: Company regulated by the "Code des Assurances". Limited company with a consolidated capital of 252,432,825€ untied funds. Head office: 8-10 boulevard de Vaugirard - 75724 Paris cedex 15.352 358 865 RCS Paris. The events guaranteed and the conditons figure in the contract.